The Game Crafter, LLC (TGC) is the world's first web-to-print game publisher with a print on demand game publishing system. Launched in July 2009, TGC allows game designers to make a board game, card game, or custom playing cards through a web-based game wizard. Visit https://www.thegamecrafter.com/start for a guided tutorial. If a game designer wishes to sell their game in the shop, there are no upfront costs and the designer keeps full ownership rights to the game. Designers set the retail price and receive 70% of the profit from sales. TGC keeps 30% of the profit to cover the costs of staff and running the site. Royalties are paid weekly and a designer can un-publish the game from the shop at any time. If you are launching a Kickstarter campaign for your game, be sure to look at The Game Crafter's Crowd Funding Promotion and Bulk Order Fulfillment services! Our print on demand process makes thing easy for you. Just submit your spreadsheet with your backer information and we'll print and ship the games! This means you won't have to spend days individually shipping rewards to your backers! Purchase affordable game art from our Game Design Assets Shop! Do you need artwork for the game you're designing? Our new Game Design Assets Shop at https://www.thegamecrafter.com/design-assets has over 300 sets of illustrations, card designs, currency, and icons for sale. Most of the art is sold under our standard commercial license, that gives you the rights to do almost anything you want with the assets, except resell them yourself. This gives you flexibility to use the images to build your game, promote it, and even sell it. You'll find the assets are very affordable and that we provide contact info for the artists if you wish to commission more from them. Purchase game pieces in any quantity! The Game Crafter is a great place for board game designers to purchase game parts. With over 2,005 game pieces and parts in stock, we have an excellent selection of dice, pawns, miniatures, pewter miniatures, meeples, card stands, tokens, sand timers, spinners, bags, poker chips, glass gems, currency, vintage game parts, and much more! Volume discounts are displayed on each product page and the discount is automatically calculated during checkout. 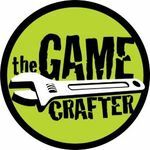 If you need game pieces and parts, The Game Crafter is the place to buy them and there's never a minimum order quantity! Buy 1 game piece or as many as you need. Custom Poker-size cards All cards printed on the same premium 305gsm black core cardstock that Magic: The Gathering uses! The Game Crafter also offers Blank Cards, Tiles, Tuck Boxes, Game Boards and other components and these are great for prototyping games!